As today is the last day of 2012 we thought we'd share some history as we steadily march into another year ahead. 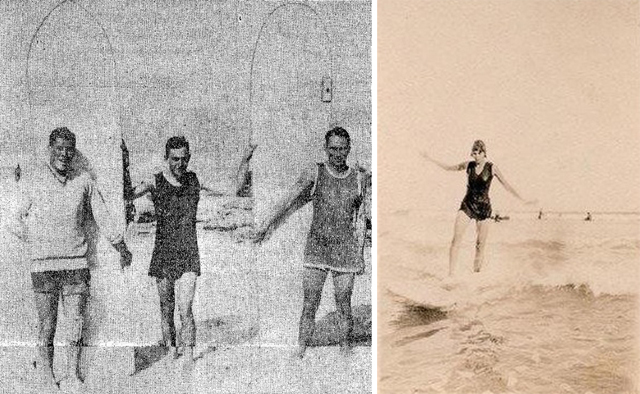 The practice of wave riding has been part of human life since the very beginning. 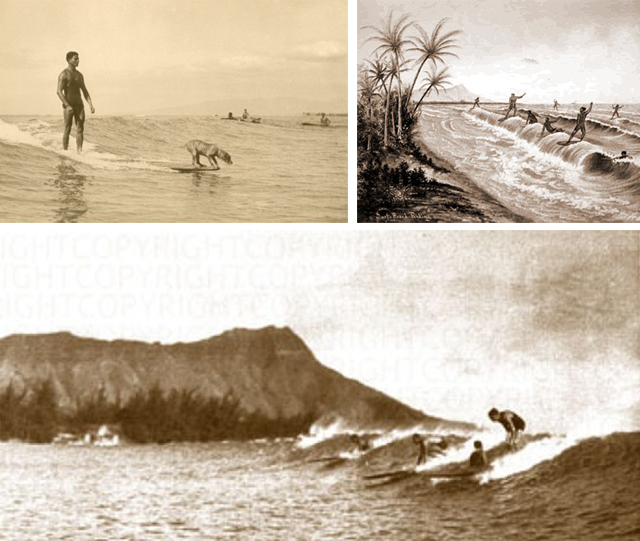 People living near the sea used wooden boards as part of their daily life, both for fishing and riding just for fun. It was an integral part of the pacific islands lifestyle and culture, in particular Hawaii where the art of surfing evolved. Muizenberg has it's own surfing history, with the earliest record of surfing in South Africa taking place in Muizenberg in1919. Heather Price, a young Capetonian got hold of a solid 'Hawaiian' style surfboard from two US marines. The general wave riding technique was to lie down on a belly board, but Heather surfed standing up. It was also here in 1922 that Tony Bowman and Tommy Charles would first ride together, paddling mainly, on what was described as a 'boat'. Some time later Tony, Lex Miller and Bobby Van Der Riet made their own boards, in a workshop behind the Arcadia Tea Room. Soon after many others joined them and surfing quickly became a popular activity at Muizenberg corner. In the early 1930's, Tom Blake is credited for creating hollow constructed wooden surfboards for the first time, alongside creating the 'fixed fin'. Today we see a surge back to basics, a longing for something more sustainable then foam and wooden surfboard shapers are popping up all around the world. Surfing on a wooden board connects you to the history and origin of surfing culture, it will heighten your connection to the elements of nature and water, and it will give you the pleasure in knowing that a Wawa board is not only an investment for you but something that can be handed down for generations to come. Check out or pinterest board for more pictures of surfing back in the day.